Close your eyes and imagine what the ideal, empowering community would look like, be like, feel like, etc. I sincerely appreciate this opportunity to share a few thoughts with you this morning on personal and community empowerment. I hope to present a larger vision of the possibilities that I believe are before us to share our wisdom, and expertise with the world in ways that further the objectives of intentional communities and community based development groups. I believe that we should continue this process and combine the Art of Community with the Science of Community. I suggest that we develop ongoing collaborative efforts to apply our shared visions and offer our expertise to help address the problems and opportunities that face our communities, our nation and the world. I hope to present enough glimpses of a "fully actualizing community" to enable each of you to play a co-creative role in developing and helping to manifest such an ultimate vision. I will offer for your consideration a few suggestions that could generate substantial income to support our own visions and missions. I believe we should be serving as consultants to communities and organizations receiving government and private foundation funding to address related issues. And I will share with you some of my personal story, a lifetime in pursuit of community. . .
First though, I would like to set the tone for my presentation with the song Earth, by David Roth from the video, Celebration of Life by Mark Tucker. Please listen for any phrases or messages in the song that are consistent with the objectives of this Art of Community Conference. What phrases sing out to you? What are the relevant messages? I believe the song and the visual images on the video capture perfectly the essence of our work here this weekend. I also believe it demonstrates the significance and relevance to the larger society of our ongoing pursuit of personal and community empowerment, both through community based development and in intentional communities. Over the past few years, I have begun to see significant parallels between personal, organizational and community empowerment. For example, Brian Tracy, one of the top Success Coaches in the world today, says that our frame of reference group is the single most important factor in determining our level of success in fulfilling more of our inherent potential. The communities we are building together are our customized frame of reference groups. We enjoy the advantages of living and working together and pursuing shared visions and missions. We’re on a quest to make a positive difference in our world. Arthur Morgan said: “A good community will not be invented, discovered or "just grow." It must be forged from the purpose and quality of the lives of the people living in it. Perhaps the most effective demonstration of the correlation between personal and community development is a story told by Earl Nightingale. It’s a powerful story about a father who attempted to distract his young son so that he could work by cutting up a picture of the earth from a magazine and making it into a puzzle. When the son returned almost immediately with the completed puzzle, his father asked him how he did it so quickly. The son said: "It was easy, dad. On the other side of the picture of the earth was a picture of a man. When I put the man back together, the world was together too. For as long as I can remember, I have been interested in community, community development and empowerment. In my early teens, I used to envision living in a community of friends as I played in the woods in the remote hill country near Calhoun City where my father had lived as a young boy, Even at that early age, I sensed a desire to live with other people of like mind in a setting designed to further personal and community advancement. At the age of 19, I received an unsolicited grant from the Quaker American Friends Service Committee to establish a Community Development Center in the Mississippi Delta to support youth empowerment and desegregation of the public schools. When I was in my early twenties, my wife and I spent many pleasant hours drafting a screenplay, which we hopped to use to raise money to build a spiritually oriented community in the Ozark Mountains. As we traveled around the country through my work as a Federal Disaster Relief Specialist, we began to learn about intentional communities. We developed an attraction to those with a spiritual orientation and a focus on empowering succeeding generations, a value we shared as parents of two young children. In 1975, we leaned about the intentional community of Stelle, Illinois, which had been established upon the philosophy and worldview presented in a book, The Ultimate Frontier. We moved to Stelle in 1978 and I have lived there for most of the past 21 years. After living in intentional communities and working in various government positions in community and economic development, I discovered the field of Community Economic Development in 1990. See if you agree with any of these . How many of these principles relate to your work in Community? Ever since I learned about Community Economic Development and the accomplishments about 2,500 Community Development Corporations (CDC's) in America, I have felt that we in intentional communities need to engage in dialogue and a process of sharing our vision, dreams and expertise with each other. It would seem mutually beneficial for those of us who have enjoyed the unique advantages of accelerated personal, organizational and community empowerment and development we experience in intentional community to share our resources with the tens of thousands of CDC participants who have realized equally important accomplishments. "When a community and its people are empowered, they have the capacity to articulate their needs; to identify actions to solve those needs; and to mobilize and organize resources in pursuit of commonly defined goals. When the people of a community come together to visualize and work together to achieve a common future, they recognize that everyone-­regardless of education, job, race, age, or background--has something important to contribute to personal and community empowerment. Indeed, the greater the diversity of the participants, the richer the vision and the more effective its accomplishment." Just imagine the possibilities if our combined wisdom, experience and resources were harnessed in a synergistic manner. How many more people could benefit from the state-of-the-art community development techniques if they were more effectively manifested within the intentional communities movement? And how much more effective could the CDC's be at enabling their citizens to realize more of their full potential as co-­creators of their individual and collective destiny if we share with them our expertise in consensus work, conflict resolution, and a balanced approach to meeting individual and community needs? Over these two days of the Art of Community Conference, we share an opportunity to glimpse some possibilities of what some might call heaven on earth. We've learned some of the most valuable wisdom from the thousands of intentional communities which many communitarians suggest serve as research and development laboratories for America and the world. 1. A dual commitment to transformation, both personal and planetary. Dedication to individual growth and to serving the needs of humanity. human resources, rather than competition and being "Out for Number-I"
3. A deep respect for the environment, to restoring ecological balance and "living lightly" on the earth. To develop solar and wind energy, organic agriculture. 4. A spirit of experimentalism- in both work and relationships. A commitment to "working through" the shadow side of the personality, to confronting conflict between individuals and within the self. To bringing out the dark side for transformation into affirmative alliances. 5. A new economics: Finding businesses and ways to manage them that put human values on the bottom line and still return a healthy profit. 6. Common sense. The determination to find practical solutions that work toward conquering society's problems of pollution, inflation, violence and alienation. 7. A holistic approach to health: Exploring alternative healing from herbs to acupuncture, nutrition and massage, to preventive methods aimed at helping people to take responsibility for their own health. 8. Building a positive vision: The determination, far from grim, to build an example for a better society and to live tomorrow's world today. And to make their insights available, through outreach programs, to local communities and the world at large. (9) Self government by consensus. Working with group process and evoking the intuition of community members in the decision-making process. 10. A world network. Cooperating with similar communities throughout the world, sharing skills and services, taking political action - and forming the vital nucleus of a new civilization. I believe you win agree with me that these 10 characteristics of intentional communities which were described in a 1983 copy of The Tarrytown Newsletter rare still evident in 1999 as demonstrated in the sessions presented here by members of the Fellowship for Intentional Community. During this Art of Community conference, we've also been introduced to some of the significant contributions of MAHP and Mary's leadership. Generating 40 million dollars of affordable housing for 1,400 people in just 7 years is a remarkable accomplishment. According to the National Congress for Community Economic Development, there are about 2,500 Community Development Corporations (CDC’s) like MAHP in America. These community based development organizations have generated about 100,000 jobs, developed over 400,000 units of affordable housing and they have developed or renovated about 20 trlllion square feet of commercial and industrial space. These are outstanding accomplishments for what are often grassroots, community based organizations comprised primarily of so-caned "disadvantaged citizens" located mostly in economically distressed communities. These are frequently misperceived as the" empty”, "hopeless”, and "imprisoned" people Dr. Kretzman referred to yesterday in both his keynote address and workshop. While I understand the point John said Edna Johnson made about being put in prison by what other people perceived about those who lived in the South Bronx, 1 believe it is usually we ourselves who construct our mental prisons. My good friend and partner in Expanding the Circle of Success, Les Brown, loves to tell what I think is a relevant story. It’s the story about how he responded to a teacher's direction to go to the chalkboard and work out a problem. Les told him he couldn't do it because he was learning disabled. That teacher said to Les, "Don't ever say that again. Don’t ever let someone else's opinion of you become your reality." After twenty years of studying, applying and teaching various success principles and techniques, I have observed that there are three primary factors that determine the level of success we realize in life as individuals and organizations. I believe these are the clarity of our vision, the definiteness -of our purpose and the appropriateness of our beliefs, attitudes and actions. Because I also believe these three success factors are applicable at the community level, I am committed to helping provide expanded access to resources for personal and community empowerment and greater interchange between intentional communities and CED. I believe we have an opportunity to further explore how the experiences of intentional community and community-based development might represent two halves of a whole, a whole mostly unrealized in our past. By considering every aspect of development as an essential component of one process or evolution, we can accelerate the realization of our inherent potential, at the personal, organizational, community, national and global levels. If it is true as many prominent experts suggest that most of us only use about 5% to 10% of our full capacity, isn’t that also probably true of the communities we live in and the organizations we work through? Psychologist Abraham Maslow developed the Hierarchy of Needs which most of us are familiar with. He also described what a "fully actualized person” would be like. How they would think, and act and live. Paul J. Meyer, the leading self-improvement author of all time, created the Total Person Approach, which is somewhat similar to Maslow's concepts. Mr. Meyer also developed The Wheel of Life exercise to help individuals discover how well they are doing in six major areas of life: Physical and Health; Financial and Career; Social and Cultural; Mental and Educational; Family and Home; and Spiritual and Ethical. Please take a minute to complete the Wheel of Life for yourself. You will see there are 10 marks on each spoke. Place a dot on the spoke that represents your present level of satisfaction in that area. Now connect your dots. What does your wheel tell you? Would it roll? Do you have some unfilled potential? Are there some areas you might want to set goals? Over the past few months through our Expanding the Circle of Success project, we have been using the Wheel of Life to help people assess just how well America is doing in these six areas. For example, if only 5 of 100 individuals retiring at age 65 in the richest nation on earth are financially independent and over 40 are dependent on one program or another, how well are we doing on a scale of 1 to 10? About-20? And if half of the women murdered in America in 1995 were killed by their spouse or partner and if two thirds of the children who were murdered were killed by their parents, just how badly are we doing in the area of Family and Home? Minus 20 or -30? Today, it seems easier than ever before to see the negative aspects of our society and the world. I wonder if we might be able to discern a more positive vision of what a fully actualizing community might look like. The Community Economic Development Principles I shared earlier present some possible evaluation criteria. There have also been a few individuals who have given us a view of what a fully actualizing community might include. For example, the descriptions of a Great Community by Arthur Morgan paint a picture of what is Possible. "The Great Community must be built on a full all-round view of life and its possibilities. The Great Community will achieve a living unity. It win not be just an aggregation of individuals, families, congregations, firms, cliques, and interests. Holding that "that which unites us is greater than that which separates us”, it will develop unity of outlook, purpose, and program without thwarting individual or group autonomy. Its various organizations will not tear the community apart to advance themselves, but will be agencies for enlarging and unifying community life." “The aim will be to seek unity, fellowship, and a sense of good proportion, so that the community shall be united in the aim of making possible for each of its members a fun and varied development of his/her life according to the needs of the community as a whole and the needs of his or her individual genius." “Let us imagine the community where we would all want to live. It is a community where families, regardless of income or structure, have access to a wide variety of services and programs designed to nurture and strengthen them. It is a community where residents have opportunities to find jobs that match their skills and provide a living wage. It is a community with different economic classes; but where a person begins life is not the primary determinant of what they can achieve. It is a community that encourages its members to be active participants in all phases of life by acknowledging that everyone has skills or ideas that can contribute to bettering their world. It is a community that recognizes that some tasks cannot be completed and some goals cannot be achieved alone. Indeed, cooperation and interdependence, not competition would be the key characteristics of successful communities and a successful society. Let's take a look now at a modification of the Wheel of Life designed to help evaluate the positive factors of what might be called a "fully actualizing" community. What you have before you represents my best initial efforts to incorporate within the limitation of only 8 categories, the wisdom and experiences of intentional community, the Principles of Community Economic Development, and the wisdom of Arthur Morgan, M. Scott Peck, Lorainne Garkovich and others. How would you rate your community on the Wheel of Life? What changes would you make to the factors I selected? What other ways could we effectively measure how well our communities are assisting us to develop our full potential as individuals and as communities. Please write to us and let us add your insights as we continue to refine this exercise to promote discovery of fully actualizing communities. I agree with a recent cover story from Communities Journal of Cooperative Living that boldly stated: "Community is the answer to every question Y2K raises!" I believe that sustained pursuit of the objectives of this conference may lead us into new fields of discovery, of clearer understanding of who we are, as individuals and as organizations, and discover our ultimate purpose for being, serving and contributing to the whole. 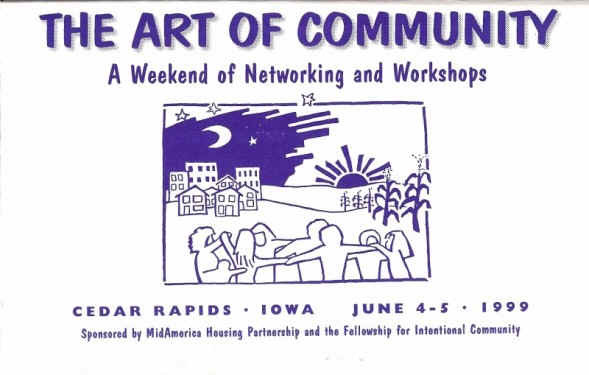 By continuing our quest here at this Art of Community Conference to build bridges between the unique contributions and resources of community based development and intentional communities, we may discover more clearly what a fully actualizing community would actually look like. If it is true that the model must precede the statue and that we must be able to see clearly what it is we desire before we may have it, then let us go forth in pursuit of the Art and Science of Community. NCCED, (National Congress for Community Economic Development) is the trade association for the 2,500 CDC's and it has national conferences every year at various locations across the country. We could establish a working committee out of this conference to develop and submit proposed sessions that would be presented at these conferences to build greater cross ­awareness and collaboration between Intentional Communities and Community Based development groups? Thanks to the vision of Secretary Cuomo, the U .S. Department of Housing and Urban Development now publishes a combined Super NOFA, or Notification Of Funding Availability. The current year Super NOFA provides 2.4 billion dollars, mostly to communities and to 3,500 Public Housing Authorities. Some of the HUD money is set aside for Community Outreach Partnership Centers to encourage collaboration between institutions of higher learning and communities. Perhaps this is an area where we could contact present and prior recipients of funding to offer our services and partnership. Many of my associates in personal, organizational, housing and community economic development pool their resources and resumes and they submit joint proposals to HUD to provide technical assistance and consulting services. I suggest that we consider setting a goal of being prepared to submit a joint response to the next HUD Super NOFA to share our expertise in the Art and Science of Community. In Star Trek's First Contact, Captain Picard says: "The acquisition of wealth is no longer the driving force in the 24th Century. We work to better ourselves and better all of humanity." I believe that we in this room are already manifesting this future vision. It is perfectly apparent through this conference that betterment of ourselves and betterment of our communities are our shared objectives. Let us further clarify our vision and discern what a fully actualizing community will look like. Let us develop the definiteness of purpose required to discover and achieve our ultimate destiny as individuals, organizations, and communities. Let us manifest the appropriate beliefs, attitudes and actions that win ensure our success. One of the quotes Paul J. Meyer is most famous for is: "Whatever you can vividly imagine, ardently desire, sincerely believe and enthusiastically act upon, must inevitably come to pass." In closing, let me share with you a paraphrased quote: Whatever ultimate vision of your community you can vividly imagine, ardently desire to share with others in mutually beneficial, co-creative ways, sincerely believe that you can achieve together, and enthusiastically act upon with an attitude of service, must inevitably produce the Great Community Arthur Morgan described, a fully actualizing community that will surpass most people's wildest dreams of what is humanly possible! I applaud the leadership of MAHP and the FIC for initiating this process and for making it possible for us to share this experience and explore these opportunities. Thank you all for this opportunity to share these thoughts on personal and community empowerment with you. Let us go forth, serve well, live long and prosper. Thank you. Copyright 1999 by Charles Betterton. All rights reserved. Charles Betterton is the founder and CEO of CENTER SPACE, Inc., a nonprofit membership organization, that fosters spiritual, personal, organizational and community empowerment. CENTER SP ACE is developing a University for Successful Living TM and an international network of locally initiated Centers for Successful Living TM that offer a broad range of publications, seminars, and workshops to help people, organizations and communities see, believe and achieve all they can be, do and have. CENTER SPACE's target audience is primarily the 95% of the world's population who is not generally provided access to state-of-the-art development training programs and successful living principles. The organizational mission is to establish a comprehensive system and process to develop and deliver ongoing training and capacity building resources within churches, nonprofit organizations and communities. Charles has over 25 years of administrative experience in national and local government and nonprofit organizations involved in spiritual, personal, organizational, community and economic development. He holds a Master's degree in Community Economic Development and is the author of the Introduction to Personal and Professional Success Techniques Seminar; Motivision TM: 21 Steps to Succesful Living; and The Ultimate Life Inpowerment TM Planning System. For more information, write to: CENTER SPACE, 127 Sun Street, Stelle, IL 60919 or call 760-212-9931.